Static billboards and banners are a thing of the past as digital out-of-home advertising (DOOH) well and truly takes over, paving the way for more creative and powerful customer engagement strategies. Facial recognition, augmented reality, beacon technology, real-time temperature parting and programmatic platforms are just skimming the surface of what is possible by way of DOOH advertising. “At a high level and strategically, a lot of success we’re seeing in the business is with clients who are increasingly recognising the different role that out-of-home can play in their media mix,” Adshel’s chief commercial officer, Mike Tyquin, told CMO. Experts agree one of the key benefits of digitally powered OOO is about using the various formats in a targeted, real-time way to hit the right customer at the right time and at the right place. To do this, ad tech vendor, TubeMogul, and ad exchange platform, Site Tour, jointly launched a new platform allowing marketers to purchase digital advertising on thousands of out-of-home billboards, kiosks and elevator screens across Australia programmatically. Following integration with TubeMogul’s software in April, Site Tour’s DOOH ad exchange opened up a video inventory across screens in different environments nationally in real-time. 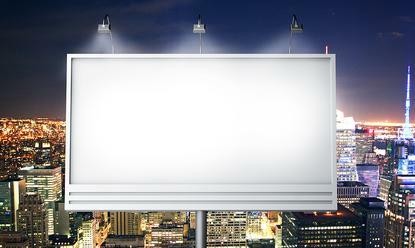 Targeting was available by format such as on a kiosk or billboard, as well as location and time of day. The ads appeared as 15-second videos and offer online advertisers the opportunity to target consumers in the real world with the same flexibility and targeting they have enjoyed online. Last year, Adshel launched a digital train campaign with Air Asia that involved linking digital screens to the airline’s live pricing systems. A consumer that walked through Town Hall station might see a flight to a particular destination in Asia at one price, then a different price if half an hour later, Tyquin said. It’s the same experience a consumer has online. “We’re seeing a lot of retailers expressing a lot of interest to plan out campaigns based on a similar basis,” he said. According to oOh!Media’s head of client content, Alex Mcintosh, DOOH is allowing constant innovation by helping marketers continue to find new ways to creatively engage with customers in real-time. Earlier this year, oOH! 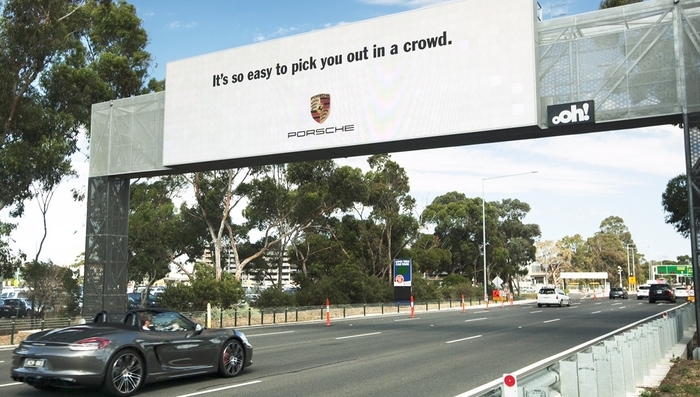 worked with Porsche Australia to launch a new digital out-of-home advertising campaign at Melbourne Airport displaying a targeted message to drivers of its luxury vehicles. The ‘911 Turbo’ campaign relied on the company’s content management system, Argyle, along with IBM software to determine when a Porsche is nearby. A camera placed 300 metres ahead of the billboard was used to analyse the vehicle make and model to identify the right cars to target. The billboard then changed to display the targeted message: “It’s so easy to pick you out of a crowd”. Mcintosh said a vital component in the campaign’s success was using image recognition technology to see the make and model of cars driving past the billboard in real time. “We challenged ourselves as a business to look at how we can use real-time data to help our advertiser to engage with our audience in new and innovative ways,” he said. Last year, Adshel made headlines with its facial recognition campaign marking the release of The Amazing Spider-Man 2. This was achieved by recreating an iconic scene in the movie where Electro controls electricity and takes over digital billboards in Times Square. Closer to home, interactive touchscreens allowed commuters to take a photo of themselves and submit them to be subsequently broadcast across the entire digital network in Town Hall station. Wherever commuters moved through the station, they were able to see their face on a digital billboard – much like Electro in Time Square. “If advertisers bring the right content and messaging to their campaign, there’s a powerful combination there for them to cut down on the latency or lag time between them and the customer,” Tyquin said. Participation also formed part of a recent campaign by Meat and Livestock Australia (MLA), giving customers the ability to print recipes with the push of a button on ‘ShopaLite’ panels in shopping centres. The campaign was done in partnership with oOh!Media. OOh!Media recently rolled out a creative participation campaign for Lipton Ice Tea in New Zealand, where panels were set up in university and retail environments for four weeks and based the creative theme ‘it makes you cool’. When people touched a panel, a spray mist of water would come out and cool them down. Another example of customer participation in action was Paspaley Pearls’ recent content-led airport campaign. Customers could, by either tapping or scanning downloaded content, or using Wi-Fi and other channels, access a seven chapter short story featuring the luxury pearls. “In all these cases, new but different techniques were tracked, new revenue was attained but also new opportunities for advertisers to engage using the multitude of different technologies was being created almost daily,” Cook said. It’s not just content created by marketers and agencies, either. In a recent activity, ooH! implemented a university product called hijacked.com.au, where content was created and curated by students and linked to native content by clients. The company’s commercial director operations and technology, John Purcell, said the uniqueness of the campaign was that content was written and edited by the students themselves. One of the latest innovations in DOOH advertising has been ‘temperature parting’, which gives advertisers the opportunity to dynamically change their message based on the local temperature at each location. Brands that have rolled out temperature parting and seasonal parting-type campaigns locally include Holden, Unilever, McDonald’s, Suncorp and Dimetapp. Another fresh development is linking OOO to other channels, such as TV, through triggers. oOh! 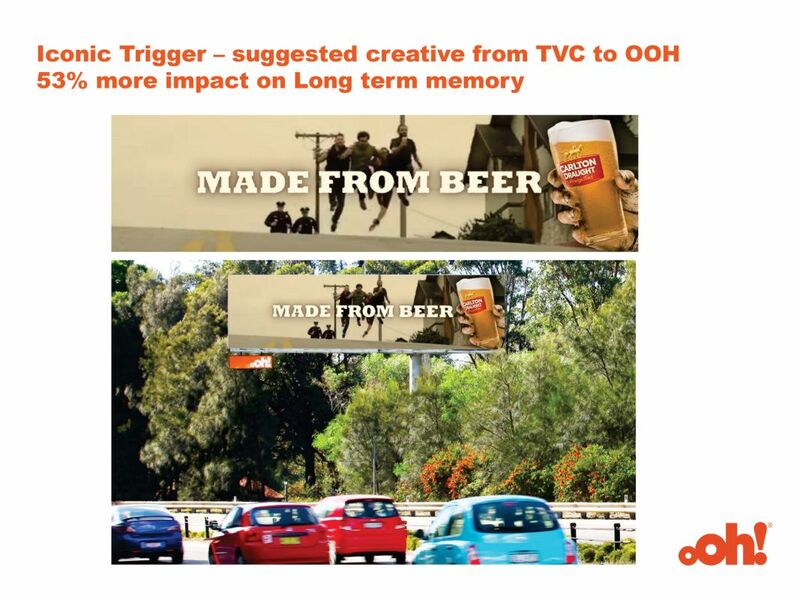 Media recently conducted the first global ‘Iconic Trigger’ study, which found that by identifying the most powerful or iconic moment in a TVC or video pre-roll, and applying it to out-of-home environments, advertisers could increase a respondent’s long-term memory measure by an average of 42 per cent. One of the ads used in the testing was Carlton United’s ‘The Great Beer Chase’. The TVC can not only be analysed to understand what the iconic moments are within the campaign, but also to demonstrate how to utilise these moments in outdoor signage to increase the effectiveness of the campaign. Cook said results showed out-of-home campaigns that used iconic triggers in their creative strategy had greater impact by tapping into consumers’ long-term memory, which is linked to enhancing the overall ROI of a campaign. A third innovation is connecting OOO with beacons. AdShel recently announced it is deploying 3000 beacons across the network in what it claims is the largest beacon deployment in the world. The beacons will initially be used as ‘listen and learn’ devices to build insights on consumers, as well as for advertisers. Longer term, Adshel hopes the technology will allow advertisers to leverage their existing customer databases to send geo-targeted and contextually relevant messages to customers standing within the vicinity of an enabled Adshel panel. Tyquin dismissed any privacy concerns with linking beacon technology and DOOH advertising, and data collection and sharing with third parties. While the technology making real-time outdoor interaction has officially arrived, there are challenges to how DOOH utilised effectively. According to TubeMogul ANZ MD, Sam Smith, one the major limitations is that it is bought and sold through lots of complex packaging, along with negotiations and locking down of the media schedule, which is done a lot ahead of time. The other big hurdle is measurement. To combat this, TubeMogul has been working aggressively in Australia to prove the audience measurement, Smith said. Smith said TubeMogul wanted to standardise the way brands applied and used DOOH, with a focus on programmatic video advertising. TubeMogul is also through programmatic buying allowing advertisers to move money in the OOH solution and then move money out without having to commit long-term to any screen. For Adshel’s Tyquin, one of the biggest frustrations is regulation preventing development of roadside digital advertising in Australia, compared to other global markets that have embraced the trend. “That’s a regulatory and governmental issue, but the industry is working pretty hard through the media association to work with a number of government bodies at both federal and state level to ensure that there’s a balanced approach to development,” Tyquin said. According to Cook, while there are always limitations and challenges across different technologies, the key is to find innovative ways to keep customers engaged using the right capabilities. Mcintosh pointed out billboards come in all different shapes and sizes, which adds complexity from a design and implementation perspective. To overcome this, oOh! built templates so brands can type the message once, choose which image they want and have it up instantly. The company is also rolling out interactive panels. According to Tyquin, the next generation of new technology falls into four key areas, the first being developments in digital display. “We’ve seen some fantastic digital display technology, be it flat screen or LED products, and they will become lighter, slimmer, more high resolution than they are now and cheaper – so that’s very exciting,” he said. A second significant developing opportunity is mobile crossover space conversions, Tyquin said. Data generation and management is another area Adshel continues to works closely with its clients and advertisers, while automation and programmatic are both significant areas of future commitment for the business. Whatever the next innovation, Cook said the thing brands need to learn more about is how to achieve more direct response engagement through DOOH. DOOH is more than just digital signage, Cook said, it is part of creating an overall strong brand proposition. Smith added that if a brand’s video strategy on digital OOH screens sits alongside what it is doing with desktop video, mobile video and television, engagement becomes much more powerful.